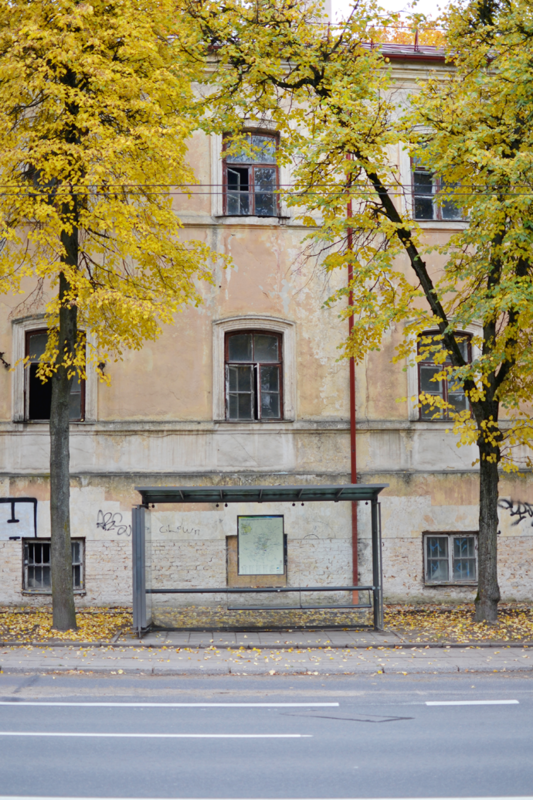 It’s been well over a month since K and I returned from Vilnius and I have no excuses whatsoever for why this post is up so late. The only reason is that the task of going through 300+ photo’s and editing a good few for the blog seemed so daunting on top of everything else I had to get done. Those of you who follow me on Instagram might have seen that we got the keys to our new home yesterday, so basically the last few weeks have been spend planning and buying really exciting (not!) things such as floor tiles, paint brushes, laminate, putty and a chrome tap for the kitchen sink. I think I prefer shopping for new dresses. 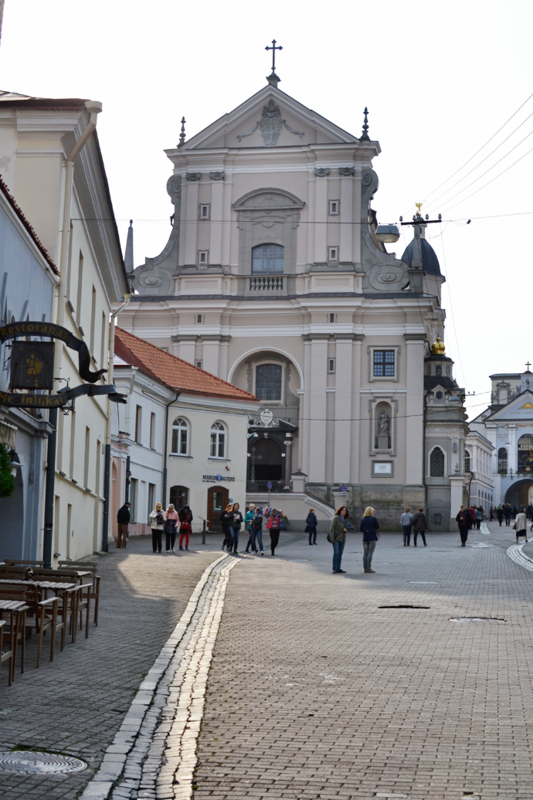 Anyway, Finally I found the courage to go through my vacation photos and share a few bits about Vilnius. I’m going to be honest here and already tell you that I’m actually more excited about the second blog post I have planned about this trip. For now: Random pictures from throughout the town! When we hopped on the bus that brought us from the airport to the city center it became clear that we had arrived just in the right time. While we had enjoyed a summer heatwave in Belgium only the week before, fall was already in full swing in Lithuania. The leaves were beautiful red and gold, the air crisp and chilly. It was absolutely stunning! From up on Subačiaus apžvalgos aikštelė we got a beautiful view over the city in all it’s golden glory. Wandering down from Subačiaus apžvalgos aikštelė we ended up in Užupis, a neighbourhood in Vilnius that is mostly know for its artistic scene. We had a coffee and wandered around a bit. Fun fact: Užupis declared itself independent in the nineties and has it’s own president. 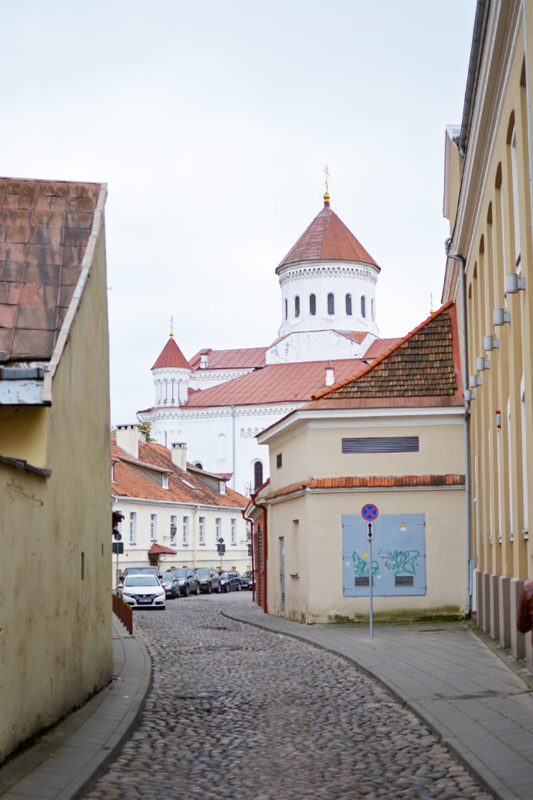 Old town Vilnius is a maze of tiny streets, often jam-packed with people. 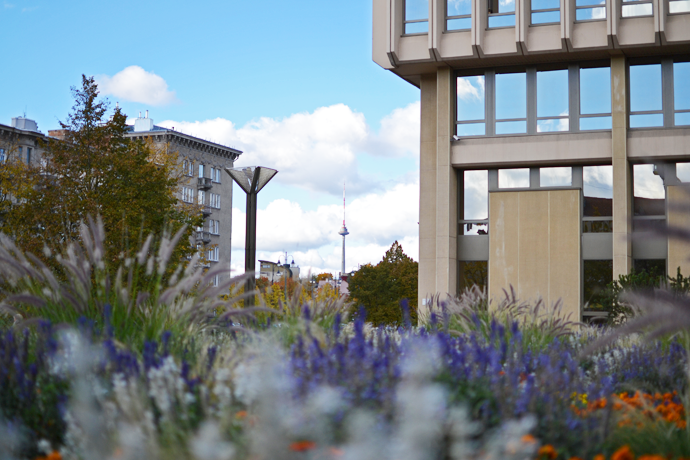 Behind every corner you might find another beautiful sight. From inside the Kempinski Hotel, which is located near the cathedral square, you have a beautiful view over the rooftops of the old town. The many churches rise up high above everything else and are as impressive on the inside as they are on the outside. 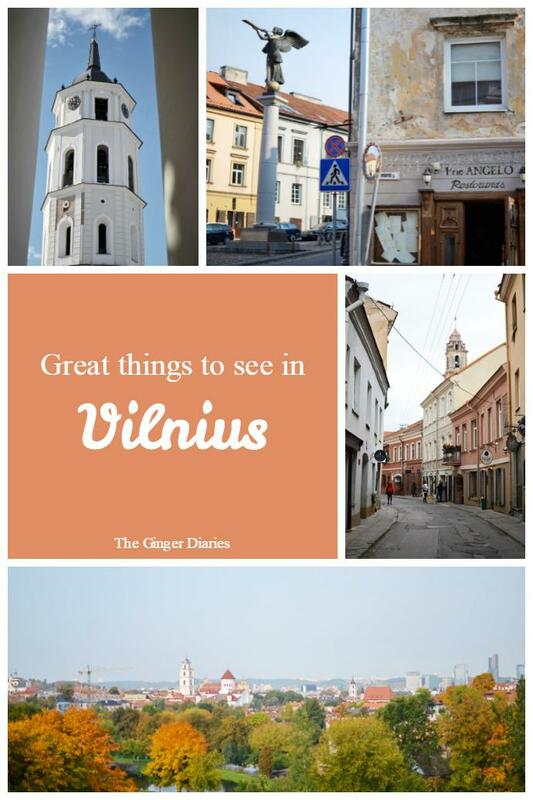 If you can, you must visit the Vilniaus Šv. apaštalų Petro ir Povilo bažnyčia or in basic English: the church of St. Peter & St. Paul. We sadly couldn’t make it inside when we were there, but the church is rumored to be one of the most beautiful in the city. 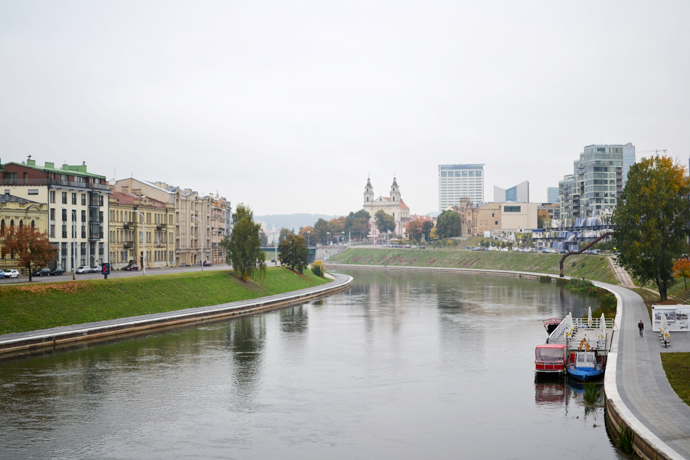 On our last day in the city we ventured across the Neris river to the newer parts of town. The river banks were lined with trees and flowers, making for a gorgeous sight and the perfect backdrop for some quick outfit photos. I think it would be lovely to sit here in the summer with a take-away lunch and do some people watching. Unfortunately it was rather misty and cold when we visited, so we didn’t stay near the water for too long. 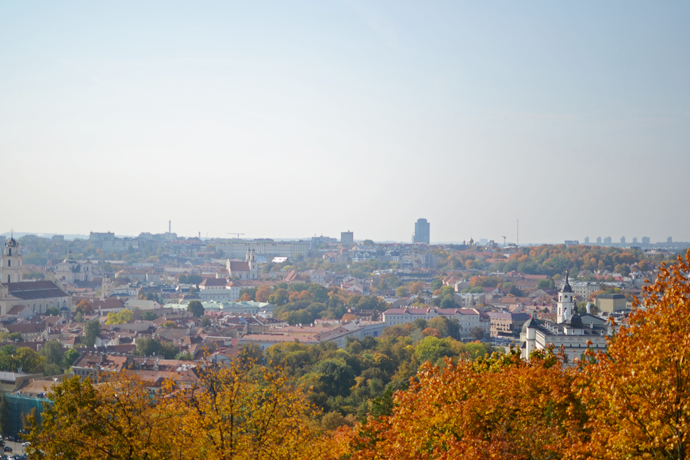 To warm up we decided to climb up to the Trys kryžiai or Three Crosses monument for another spectacular view over Vilnius. 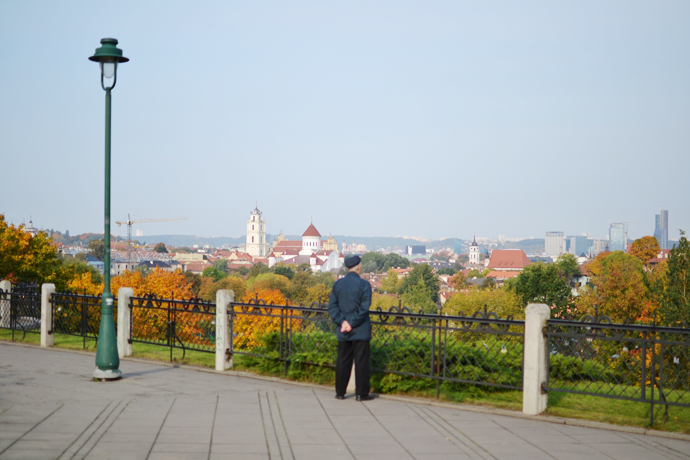 The monument is located in the hills behind the Cathedral and Gediminas tower. It’s a short, but very steep climb so make sure you are ready for that! 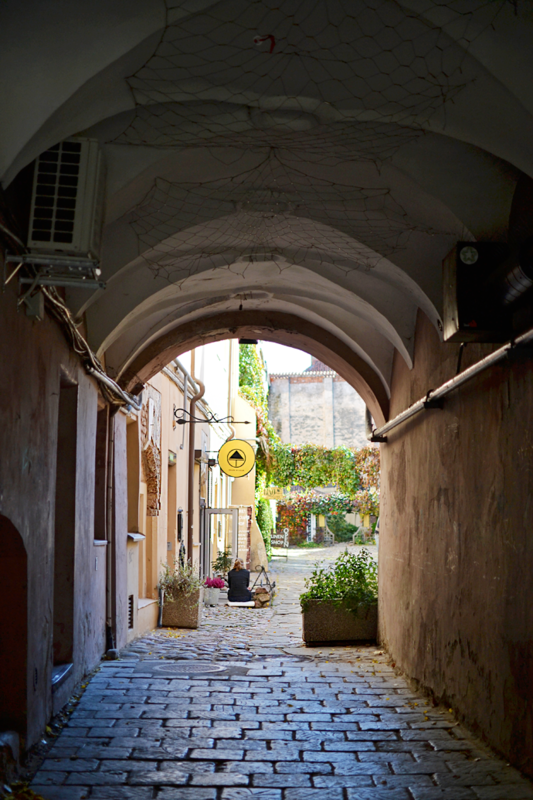 Starting at the cathedral and running through the heart of the new town, is Gedimino Prospektas. This avenue is home to all your favorite stores and a true food walhalla for all the hungry hipsters out there. 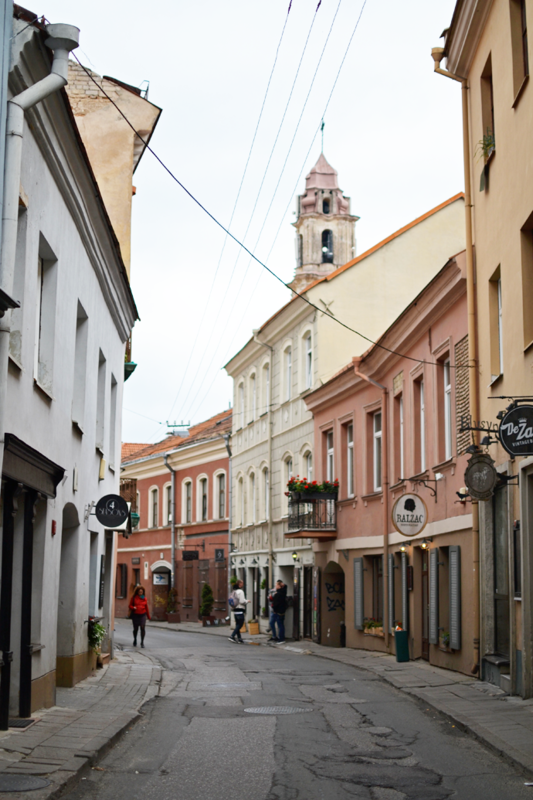 Because we ate SO much during this trip, I have to write a separate post about my favorite coffee and food spots in the Lithuanian capital, haha. Stay tuned if you are curious! I had just shopped my fall wishlist before we flew to Lithuania, so I hadn’t planned to do any shopping at all, but when I spotted the gorgeous collection from Max & Co at Gedimino 22 I had to splurge a little. I’ve already featured the dress on my blog last month (see here) and to my happy surprise Max & Co reposted my photo on their Instagram. Those were my fifteen minutes of insta-fame, people! 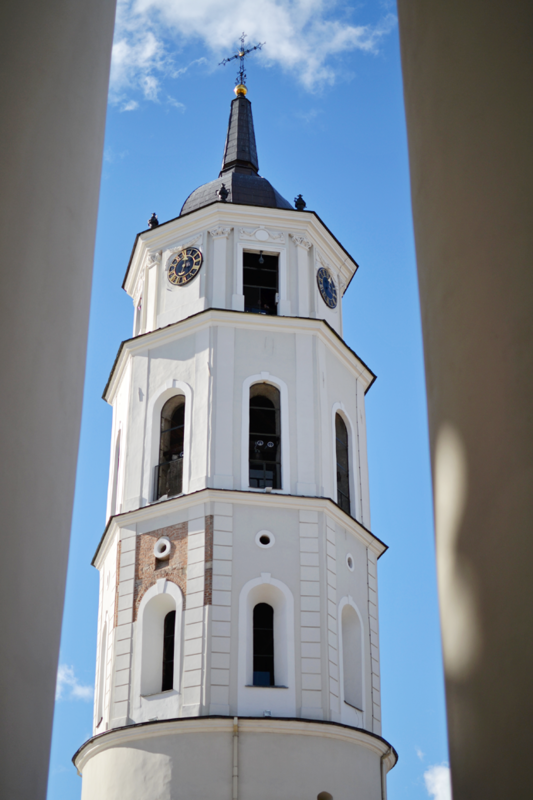 Overall we really, really enjoyed our time in Vilnius. We went there without any plans, just to wander around and eat whatever food we could find. The Lithuanian cuisine turned out not to be such a success for me, but otherwise I had the time of my life. 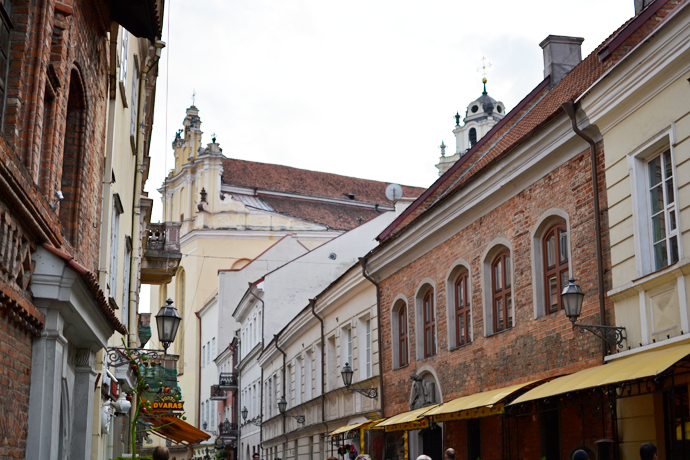 The town is really green and quiet and I loved discovering all the corners of this city. 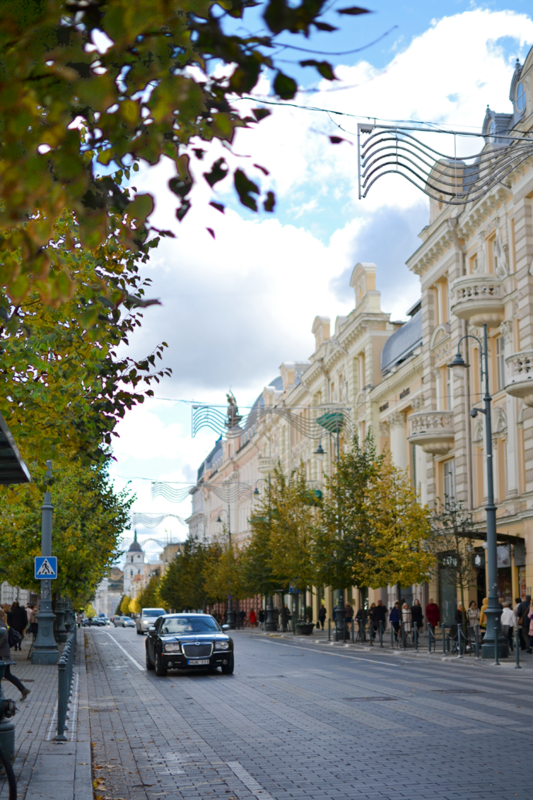 Vilnius has set our hearts open for more trips up north with Riga being high on my boyfriends list. I can’t wait! We stayed in the Bookinn B&B, an old monastery on the Dominikonu Gatve. 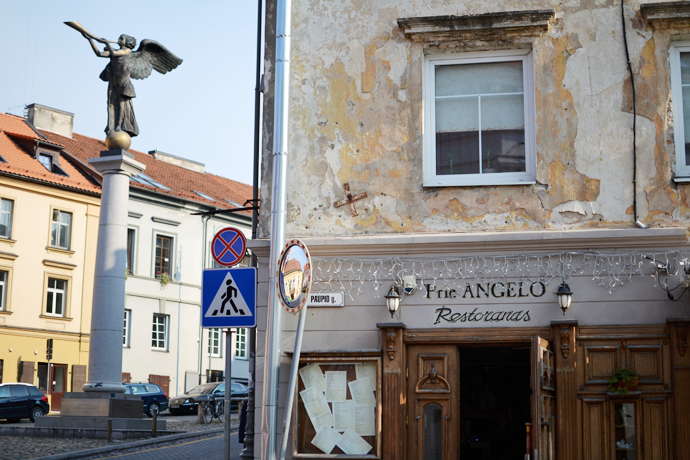 It’s right in the old city center and near some of Vilnius’s best restaurants so you can go take a nap right after dinner. No complaints about the hotel room whatsoever. Only downside: The nearest stop for buses from and to the airport is about 1,5-2 kilometers away. You could always take a cab of course. We flew with WizzAir from Eindhoven to Vilnius and came back with Brussels Airlines from Vilnius to Brussels. WizzAir is cheaper, but Brussels Airlines had better flight schedules for the return flight. 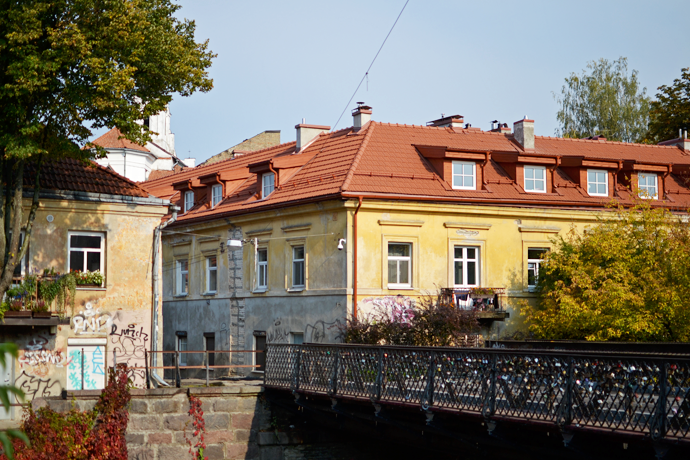 Vilnius looks amazing! My mum and dad visited earlier in the year and loved it. I love all the autumn colours just starting to change too.